Many personal electronics can play back video files from SD cards. If you have a device like this, you're probably wondering how to get your favorite movie from its Blu-ray to your SD card. In fact, it's unchallenging to copy Blu-ray to SD card for later Blu-ray watching on phones tablets computers or TVs. Things you need are as follows: Blu-ray copy software that can handle copy-protected Blu-rays, a SD card, a computer or PC. Since the Blu-ray movie structure is different with SD card, you must find a Blu-ray copy software for changing the Blu-ray movie formats to SD card compatible video formats, then you can play the Blu-ray movies on SD card smoothly. Here, I recommend a tool: Pavtube ByteCopy (Get Mac Version) that can be your best Blu-ray to SD card assistant. This Blu-ray to SD card Converter is able to remove all Blu-ray copy protection and region code in the background, even the latest Blu-ray encryption can be auto bypassed according to the test, next, the only thing you need to do is to choose the video formats for SD card, such as: WMV, AVI, MP4, H.264, etc. In addition, you also can decide the vidoe quality, like: SD video, HD video, 4K video, 3D video, so cool. Meanwhile, it also has some features other common Blu-ray copy software don't have. For example, when you backup Blu-ray to H.264 and H.265 format video on Windows computer, it can offer you 30X Blu-ray ripping speed with NVIDIA CUDA and AMD App technology. This can save your plenty of time to do other things or copy more Blu-ray movies to SD card. Want to learn more features about ByteCopy, read its review. Follow the steps below to copy Blu-ray movies to SD card fast without losing any quality for later viewing on portable devices. Run the Blu-ray copy software and click "File" ＞ "Load from disc" to load Blu-ray movie. Click “Subtitle” and “Audio” drop-down box to select your preferred subtitle track and audio stream. To put Blu-ray to SD card, you can convert Blu-ray to MP4 digital video format, which is the best choice if you want a small-sized file yet with good quality maintained. Plus, Pavtube ByteCopy is a BD/DVD tool to backup Blu-ray/DVD movie to multi-track MKV, MP4, MOV and AVI without quality loss. Click "Browse" to select a destination folder to save the output profiles for later Blu-ray to SD card transfer. When you have finished all the above settings, you can simply click the "Convert" button on the main interface and let the software do the Blu-ray to Micro SD card video conversion for you. Step 1: Insert the SD card into your reader. Step 2: Open the SD card's folder. In Windows, you will be given the option "Open the Folder to View Files" as soon as your computer recognizes the card. Step 3: Copy the video file to the SD card. You can either drag it from its current folder to the SD card's folder, or use the "copy" function in your operating system. Depending upon the size of the file and the speed of your computer, this can take up to an hour. Step 4: Make sure the file was transferred correctly. If the run time or size of the file on the SD card is different from that of the file on your hard drive, the transfer was unsuccessful. To compress the Blu-ray movie files becomes necessary if your SD card has very limited storage space. 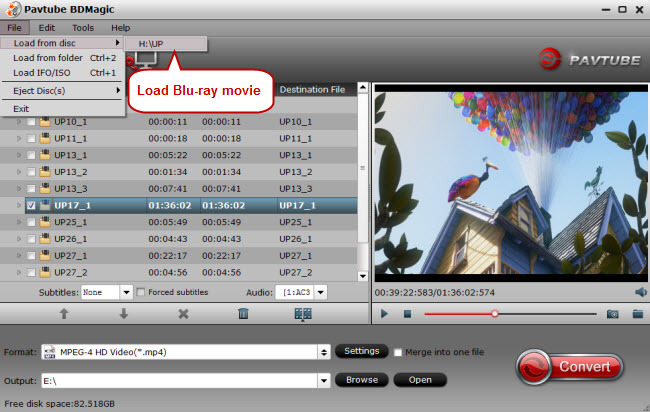 Our Pavtube ByteCopy will benefit you more than merely in Blu-ray to SD card copy. Coming with best Blu-ray compressor features, the Blu-ray to SD card transfer tool provides video editing functions for you to reduce video file size, such as cut out unwanted segments, lower the file resolution or bit rate of the output video, etc. You can do the compression work before start Blu-ray to SD card ripping process. 1. Click "Settings" button behind Format bar, to open "Profile Settings" window. You can change output video resolution to 640 x 480, which is more preferable by many portable devices such as iPhone, iPad, Android phone and tablet, etc and video sharing sites like YouTube, Facebook and Vimeo. 2. Lower the bit rate 20-50% of the default to get small files. 3. Trim video file size. Click the "Edit" icon on the UI to open "Video Editor" window. You can cut off the unwanted parts from a long video to short ones by setting the start time and ending time.